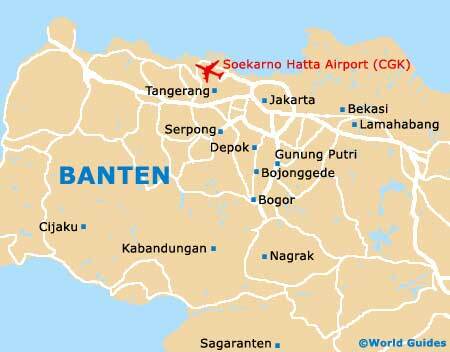 The province of Banten covers a fairly sizeable chunk of West Java. Therefore, where you are planning to stay and what you are planning to see really will determine where to look for accommodation in Banten. Hotels in Banten are concentrated around the coastline alongside the Sunda Strait, at beach resorts such as Anyer, Labuan (Labuhan) and Carita, the latter of which is famed for its views of the Krakatoa Volcano. Do note that lodging is at its most expensive during the peak, dry season, between May and September, when the weather is at its most favourable. Anyer is a particularly busy seaside resort, being home to the ever-popular Banten Beach Resort Hotel and conveniently just a two-hour journey from nearby Jakarta Airport. Hotels in Anyer lie some 15 km / 9 miles to the south-west of Merak and are spread around 5 km / 3 miles along the coastline. The best accommodation in this part of Banten tends to be clustered around the marketplace and the Anyer lighthouse. Hotels in Anyer are quite expensive, although of a high standard, and quickly fill up at the weekends, when lodging rates can be as much as 30 percent more than during the week. Further hotels in Banten can be found throughout the capital of Serang and the city of Rangkasbitung, as well as around regencies of Lebak, Pandeglang and Tangerang.